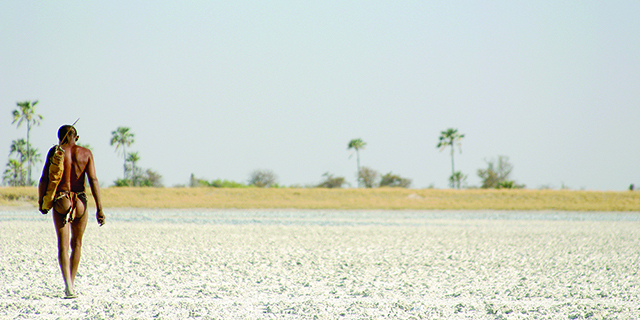 The Makgadikgadi. The largest expanse of 'nothingness' on earth, an area the size of Switzerland clearly visible from outer-space, devoid of anything but salt and shimmering horizon. A vast relic of Africa's largest body of water and a hitherto unknown cradle of earliest man's genesis. Infernal mirages warp reality into twisted parodies during the heat of the dry season and with the coming of the rains, life-giving water seeps into the pans, stimulating an annual pulse of life. The baking soda void is transformed into one of Africa's most fecund ecosystems. 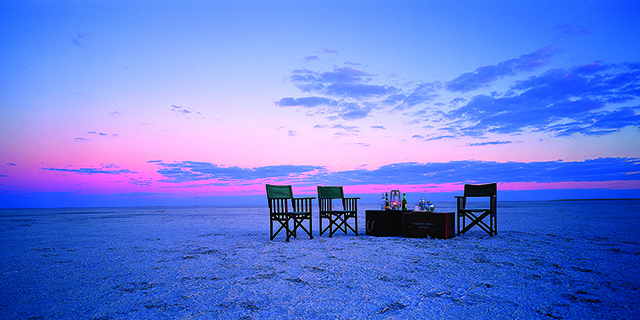 This five night safari is an in-depth exploration of the Kalahari Desert and mysterious Makgadikgadi Pans - the largest salt pans on earth. Guests enjoy three nights at San Camp, where they have the opportunity to discover the magic of the Kalahari and its fascinating eco-system. Two full days are spent traversing the Makgadikgadi's vast expanse of 'nothingness' on low impact quad bikes (ATV's), and guests spend two nights under the stars at the sacred and deeply spiritual Kubu Island. 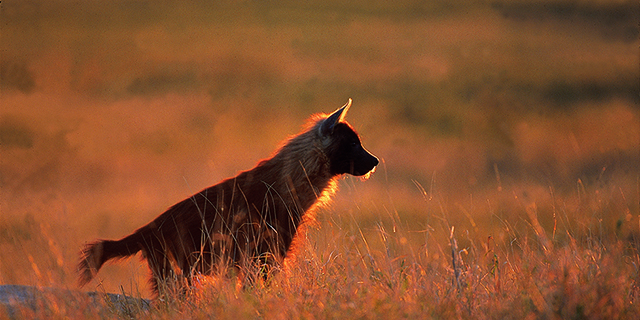 Safaris operate for a minimum of four guests on any dates from mid-May through September. Arrive at San Camp, in the heart of the Kalahari Desert. Guests spend two nights at San Camp in beautiful and romantic safari tents, experiencing the magic of the surrounding area. You will meet and interact with the area's famous meerkats (suricates), visit Chapman's baobab (one of the oldest and largest trees in Africa), and observe one of Africa's rarest carnivore species, the brown hyena. On the morning of day three, the intrepid party sets off on the quad bikes across the Great Pan en-route to Kubu Island. As guests journey to and from Kubu, they will learn more about the origins of the Makgadikgadi as a deceased 'super-lake'; they will also visit an ancient and mysterious defense fortification, which was only discovered in the late 1990s. The next two days/two nights are spent exploring Kubu Island and the surrounding area. 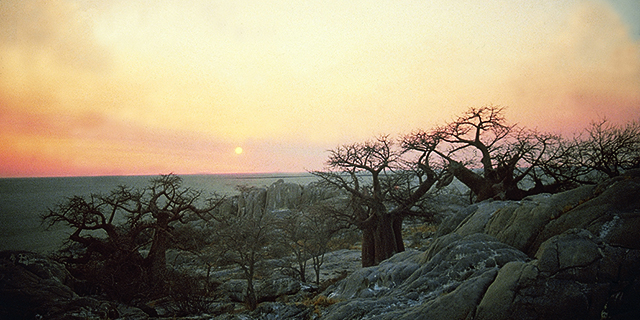 Kubu itself, a granite extrusion island studded with baobabs, is of course one of the most graphically beautiful spots in Botswana and is full of intriguing detail, such as ancient walling and European trade and Bushman beads. It is also close to what is probably the biggest flamingo breeding site in the world. Some thirty thousand flamingo fledge in the area when the pans fills with water after good rains. Visits to Kubu take place during the dry season, but the harsh story of survival for the flamingos is plain to see. Many chicks are left to die if they hatch too late for the incredible march across the Pans that the young flamingos undertake in search of water. Their remains lie on the pan surface almost petrified by the salt. Unhatched eggs also remain in some of the thousands of abandoned nests. While in this fascinating area, guests also have the opportunity to visit the extinct mouth of the Zambezi which, together with other great rivers, once flowed into what was the largest lake that Africa has ever seen. The remaining beach is covered with beautiful water-worn pebbles and semi- precious stones such as garnets and cornelians. Accommodation is in canvas bedrolls which are laid out under the stars. There are no dangerous animals and, as the Makgadikgadi is one of the most perfect places to stargaze, a starry sky makes the perfect ceiling! Hot showers and a long-drop loo are provided, and delicious meals are served on damask tablecloths set with bone-handled silver. On the morning of day five, guests depart Kubu, once again setting off across the Pans on the quad bikes to reach San Camp in time for tea. The last night will be spent in luxury at San Camp. Spend the morning walking with a Zu/'hoasi Bushman tracker. Offering a window into the past, the Bushmen teach us how they have survived in this harshest of environments using ancient knowledge of plants, animal behavior, and survival skills. Return to camp for a quick lunch before the great adventure ends at Jack's Airstrip. * The safari can operate for just 2 or 3 travelers at an additional cost (please contact us for details). * Families traveling with children younger than 12 require a private guide (at additional cost). All accommodation on a per person sharing permanent tented camp and camping basis; all drinks excluding premium wines and champagnes and premium spirits and liqueurs; activities at San Camp and on the Kubu Island excursion; use of quad bikes; services of guide and staff; park fees; the Botswana Tourism Levy. 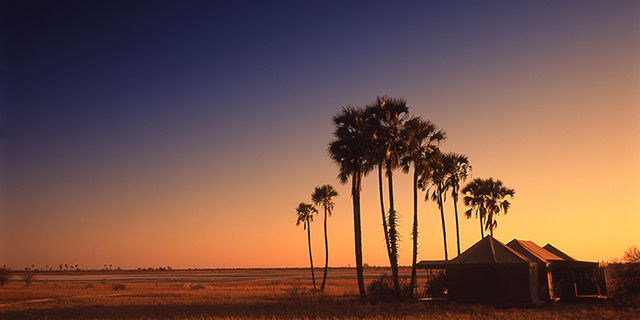 All scheduled flights and their departure taxes; charter flights to/from Jack's Camp Airstrip; all items of a personal nature; travel insurance; visas (if necessary); any new Botswana taxes; gratuities to guide and camp staff, and any activities and excursions which are not specified.